I am so excited to be able to bring you another great giveaway! You know how much we like natural skincare around here and thanks to Terra Firma Cosmetics we are able to offer our readers a chance to win a 6 Piece HydraSilk Dream Kit (Retail Value $64.95). Terra Firma offers mineral cosmetics manufactured with a focus on safe, natural and healthy ingredients. You won't find any petrochemicals, synthetic fragrances, parabens, synthetic pigments or dyes in any of their products and the minerals used are uncoated (no silicones like Dimethicone or Cyclomethicone are used) and kept as close to nature as possible. In addition, these cosmetics include sun protection (very important) which comes from a fine grade of Tytanium Dioxide and Zinc Oxide that is considered non-carcinogenic due to its inability to penetrate the healthy layers of your skin. The mineral make-up is also water resistant. The 6 piece HydraSilk Dream Kit includes: HydraSilk" Foundation - 50g (vol), "Airbrush" Prime/Set Powder - 30g (vol), "Radiance" Blush - 20g (vol), "Enhance" Bronzer - 20g (vol) and "Eliminate" Concealer - 10g (vol). 1. Visit the Terra Firma Cosmetics site and leave us a comment about a product you like, something interesting you learned or a product you would love to try. 2. Leave a comment on why you would like to win this great prize. 3. 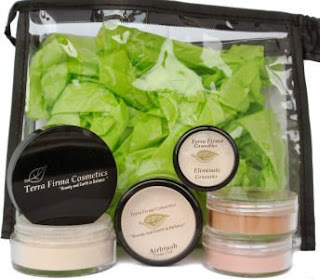 Tweet about this giveaway: "I just entered to win a Terra Firma Cosmetics Dream Kit at http://www.livingawholelife.blogspot.com/. You can too!" Entries will be accepted through Thursday, April 9th at 11:59 p.m. EST. The winner will be announced Saturday, April 10th. Wow, so many great products! I love their facial care collection--especially the decadent chocolate masque! Terra Firma Cosmetics sound great and I would love to try them. I don't wear a lot of make up because I don't like the cake look, like you can tell you are wearing make up. I did not realize they put so much junk in regular make up, thank for posting info about natural make up products. My face could use some serious help! It's doing some crazy things and I sure would love to try something new that really works! I think I'd like to try the H20 Minerals powder. I don't wear any makeup at the moment but am thinking that as I get older a bit of a more 'flawless' look couldn't hurt. I love the idea of the makeup being as natural as possible as I have sensitive skin. Wow! What a great give-away,thanks so much. I would love to win these products because I just recently started converting to all-natural body and beauty products and have not yet settled on my favorite brand. I'd love to do a review to my blog readers about these products! What a great giveaway. I am off to tell everyone about it. I've never tried any mineral makeup so any of this would be wonderful! But on their site, i love the Longevity Lip Stain. Great giveaway! I've always wanted to try mineral makeup, and would LOVE to get something more natural. I would like to win this because I have never tried mineral makeup and I do not like the way that regular makeup looks on me. Wow, great comments so far. Keep 'em coming! And thanks for all the Tweeting and Facebooking!! I would love to try this. One because I don't like the cream foundation and love these mineral types. I also would love to try because it looks like great ingredients that will be good for my skin. Fabulous line! Gotta love that so many companies are reacting to the desire for people to stop "ingesting" chemicals!